The Kesa is something that is not clear. He looked at me surprised and astonished, his expression telling me he thought I Was just blabbering. Actually, the Kesa is undefinable, either by its “broken” color, a color of ruins or rags, and its dimension, which does not conform to any precise rule. It is not limited by any defined aspect that could contain it. That is the reason why it has been called “the rice field´s dress of the happiness without aspect”. It is said that Shakyamuni measured one thousand feet and that Miroku would measure one thousand feet. But the Kesa that Shakyamuni transmits to Miroku is neither large nor small, it is a dress without aspect and a “Rice field of happiness”. Actually, it is something unconceivable. The Kesa, dress of drizzles and dews, mists and clouds, is the symbol of the substance of the Law of Buddha. The sky, the earth, the whole universe, are not but a single and unique Kesa. Nothing exists outside of it. We neither climb the sky nor we descend to hell; we are not going anywhere nor do we come from anywhere. There is only one Kesa and mankind owes to itself to wear it. 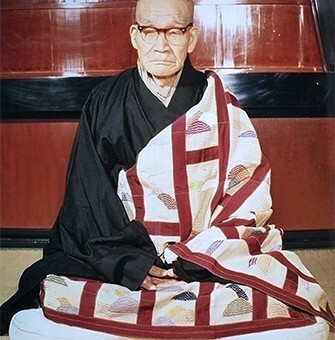 Prince Shotoku, who introduced Buddhism to Japan, wore the Kesa to manage state affairs and he wore it when he commented the three Mahayana Sutra. Emperor Shomu used to wear it to govern. Several generations of emperors have had faith in the Kesa. Also, in the warrior world: Kikuchi Taketoki, Takeda Shingen and Uesugi Kenshin have benefited of its infinite virtues. To wear the Kesa and to transmit it is the supreme joy of man. Those who think that it is nothing more than a strait formalism piece of tissue, are a toy of their bad karma, but those who are happy to take it receive their share of joy.